Location, Location, Location ~ This twelve bedroom oceanfront vacation home in Nags Head offers a private pool, hot tub and even an elevator. 'One of These Nights' was built and furnished for family fun on the Outer Banks and offers amenities and features that will please everyone. Recreation ~ The 15' x 25' private pool, lounge deck and a hot tub. There is also a private walkway to the beach. There is fun on every level ~ the ground floor has a rec room with a foosball table, home theater and a kitchen. Go up one level to the sports bar with wall mounted tv, a pool table and a wet bar with refrigerator, icemaker and microwave. On the top floor you have spectacular ocean views, a wet bar and loft. TVs, DVDs and WiFi. The loft is the perfect place to have a cold drink or that morning coffee, read a book or just enjoy the panoramic ocean views. For the Little Ones ~ Two high chairs and two Pack-n-Plays. No pets please. No smoking. Parking is available for between 7-10 cars depending on size and how you park them. Golf discounts at: Kilmarlic Golf Club - K Club - Click here for The Kilmarlic Golf Club website and Nags Head Golf Links. If you need more information please ask, we are here to help you find the perfect OBX vacation home. From the hand painted murals to the glass elevator and the comfortable and welcoming atmosphere it is evident that a lot of care and thought went into making this home the ultimate Outer Banks Vacation Rental Getaway. Accessibility Information: 1st Level - Ramp into entrance for easy access. Elevator to all floors (36W x 32D). 40 inch wide slider door to outside deck (4 inch lip). 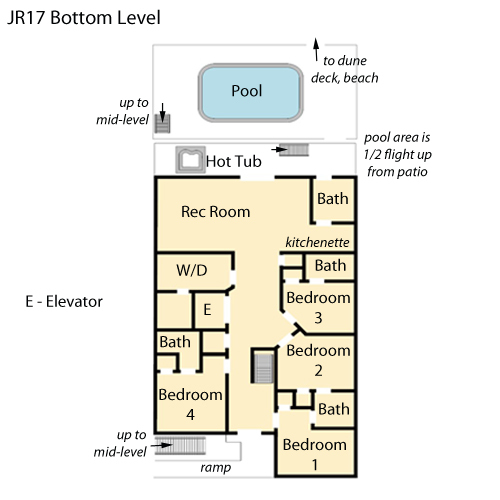 No access to pool from any levels because of steps.2nd LEVEL - Oceanfront Master Bedroom # 8 has Deck (28” Slider Door and 4” Lip to Deck), Bath with Roll Under Sink (28” High), Roll In Shower with 2” Lip (No Hand Rails or Seat), Toilet with Hand Rail; Rec Room has a 40” Slider Door which opens onto a Spacious Deck (4” Lip to Deck) 3rd LEVEL - Open and Spacious Living Area with 40” Slider Door to Deck (4” Lip to Deck); Spacious Master Bedroom # 12 has a Roll Under Sink, a Roll In Shower without Seat or Rails (Clearance between tub/shower is 36”), and a Toilet with Hand Rails; Great Screened In Porch with 28” Doorway and 5” Lip to Deck. This house was amazing. It was comfortable & well stocked. Our family had a wonderful week there. We highly recommend this property & Village Realty could not have been more helpful! Thanks for a wonderful week! We had a great time and really enjoyed the stay! The house was beautiful and very comfortable, not to mention that every one of us got our own bedroom and bathroom. Right before our vacation there was an issue with our original house and village reality was very accommodating. They quickly found us a new house that fitted our needs and we couldnt be more happy with our stay and we thank you guys for that! The neighbors were extremely noisy every night into the morning. Had a great time. Although it seems the home is ready for some TLC, the home was comfortable and suitable for our marriage ministry gathering. We had a few small issues but they were taken care of very quickly. Very good location, close to shopping and restaurants. 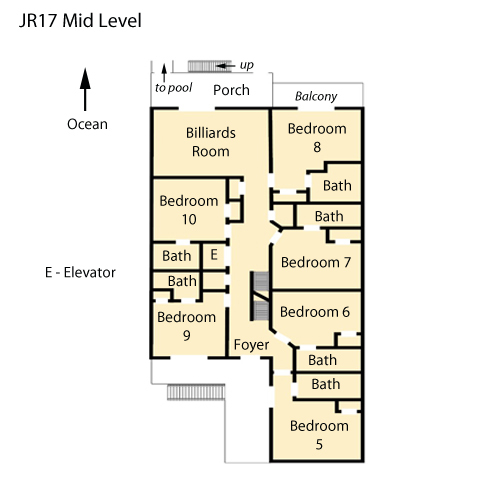 Good floor plan for large group. Poor house in cold weather, there is no heat on the ground floor. Thanks for bringing space heaters. No dishes or glassware in either recroom. Fireplace didn't work and tech didn't fix it. We were warned that one oven didn't work, but there was no indication as to which one it was. One bedroom was missed by housekeeping, hair in the bed and popcorn on the bathroom floor. Water pressure issue may have been due to very cold weather. Property manager who visited didn't enter the house. Generally disappointed in lack of office interest in our well being during the snow storm. Definitely was fend for ourselves. Surely it's a better summer rental than winter. Thank you Katherine for your review. It was a pleasure speaking with you today and I am so happy to hear overall you and your friends had a good time while visiting at One of These Nights. I would like to again apologize for the issues you encountered during your stay, our office did close due to the snow storm that affected the entire Outer Banks. Our Operations team will be fixing the fireplace and have confirmed the heat is functioning as expected on the lower level, thankfully we were able to bring out space heaters to make your stay a little more comfortable. We are pleased to hear you plan on returning to stay with us again for your next Outer Banks vacation. Had a wonderful Thanksgiving with family from Greenville, NC, Virginia Beach, Va and Columbia, NC. Everyone said "it was the best sleep and most relaxed they've been in a long time." Thank you to Village Realty and the homeowners for providing quality homes and a wonderful overall experience. Would absolutely stay here again...love the memories made this week. We could not have asked for a more perfect weekend getaway. Eleven couples enjoyed a wonderful time of fun and fellowship in the Outer Banks. The home was absolutely gorgeous. It was spacious and offered every amenity that we needed. We will definitely book this home again in the future. We really appreciate everything you do. The house is always clean and beautiful. You are very friendly! We had a great stay!